For the first time since November 2014, Mexico is on its way to Europe for a couple of friendlies. This time around it will be Belgium (FIFA rank: 5) and Poland (FIFA rank: 6). El Tri rarely leave the friendly and lucrative confines of the US for friendlies and this will present Osorio with a good chance to see his squad against top teams. The base for his 2018 squad should be clear but there are still spots up for grabs and it would be a good idea to give some players a chance to play. With the squad announced, let’s see if Osorio had any surprises up his sleeves…. It made logical sense to call in Govea since one of the games was going to be in Belgium but you just never know. Omar is having a break out season while on loan and has become an automatic starter for Mouscron. Govea has played all across the center midfield this season and even has a few goals. Even if he doesn’t see any game time, it was the right decision to call him into camp. 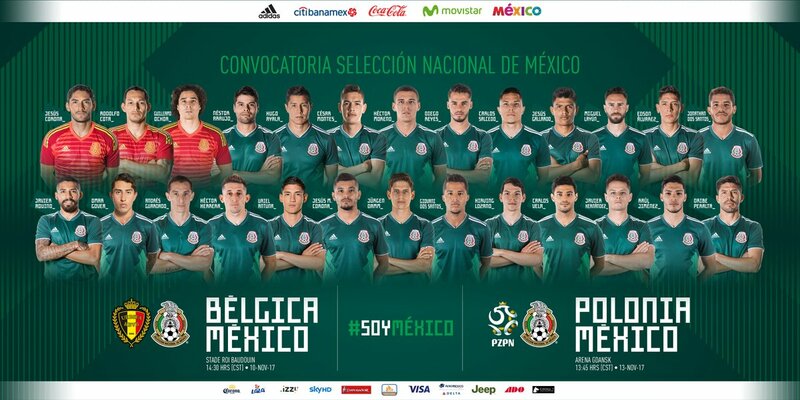 Uriel Antuna getting called up was a bit of a surprise but Osorio called in 26 players and not all can dress on game day. Calling in “extra” players is a good idea, especially when those players are young players who wont miss any games by going to camp. Antuna only has 124 minutes in the Eredivisie but he has plenty of potential. However, he is one of the few players on this list I give less than a 5% chance of making the final 23 for Russia. You can only call so many players and there will always be guys you thought should have been included. If I had to pick any snubs I would start with Elias Hernandez, who is having a great season in Mexico. Maybe Osorio just does not see him as a player who can make the final 23? A couple other guys I could have seen on this list would be Guti and Hugo Gonzalez. Both are players I can see making it to Russia. I know Chivas have had a bad season but Pizarro and Pineda are guys I could see sneaking on as the last field player for Mexico in Russia. There is still time for them to earn a spot. I’ve always been of the mind to call in 1 young keeper to every camp. Regardless of them playing in a game, I think its good experience. If Osorio did that, he should have called in Hugo or Raul Gudino into camp. Miguel Layun is very talented but he is only 1 man. He can’t play both fullback positions at once. Yet, he is the only natural one Osorio called in. Gallardo has played at left back but he is a winger. Salcedo has seen time at right back but never looks more than a center back trying to play right back. Maybe this means JCO will go with 3 in the back? I’m surprised and not surprised that both are in the list. Their season ended weeks ago and they will not have a meaningful club game until March. You have to call them in if you see them making the World Cup roster because they need all the help staying match fit until MLS pre-season starts. But does anyone besides Osorio really expect both to make the World Cup squad? What are your thoughts on the roster?